An oldie but a goodie from Byrne and Eno. Video by Bruce Conner. Much is being made of the supposed "uncanny similarities" between "Atlas Shrugged" and the current financial crisis. Yet somehow I don't remember the chapter where at a press conference to announce a new initiative aimed at reducing the regulatory burden on banks, "Representatives of four of the five government agencies responsible for financial supervision used tree shears to attack a stack of paper representing bank regulations. The fifth representative, James Gilleran of the Office of Thrift Supervision, wielded a chainsaw." and where "Two months after that event the Office of the Comptroller of the Currency, one of the tree-shears-wielding agencies, moved to exempt national banks from state regulations that protect consumers against predatory lending." In other words, contra Atlas, the regulations were being systematically repealed in the years prior to the crisis, not increased. 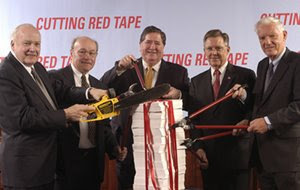 Caption: "June 3, 2003: Determined to cut red tape and reduce the regulatory burden are (l-r), Office of Thrift Supervision Director James Gilleran, Jim McLaughlin of the American Bankers Association, Harry Doherty of America's Community Bankers, FDIC Vice Chairman John Reich and Ken Guenther of the Independent Community Bankers of America"
“Americans are flocking to buy and read ‘Atlas Shrugged’ because there are uncanny similarities between the plot-line of the book and the events of our day” said Yaron Brook, Executive Director at the Ayn Rand Center for Individual Rights. “Americans are rightfully concerned about the economic crisis and government’s increasing intervention and attempts to control the economy. Ayn Rand understood and identified the deeper causes of the crisis we’re facing, and she offered, in ‘Atlas Shrugged,’ a principled and practical solution consistent with American values." The total destruction - political, cultural, ethical, economic and philosophical - of American society, followed by its total reformation according to the dictates of a 1950s novel; this is what's called a "practical" solution to the current economic crisis? Privatization of Roads. Leonard Peikoff on his mid-90s radio show on KIEV in Los Angeles stated his belief that public roads should be privatized. While this view is entirely consistent with Objectivism's laissez-faire dogmatism, it does raise questions concerning Peikoff’s grasp of basic social realities. The issue of road privatization illustrates some of the weaknesses of the laissez-faire position, particular on the issue of whether economic behavior can be effectively regulated by mere self-interest. There are basically two main issues: (1) whether the private sector would find it profitable to build roads into undeveloped or underdeveloped areas; and (2) whether private ownership of roads might lead to gross abuses that would greatly inconvenience consumers. (1) Sometimes infrastructure (such as roads, canals, railroads) is required before a given locality becomes productive. It is not unlikely, for example, that if no road existed between Los Angeles and Las Vegas, private companies would be able to raise the capital necessary to build one. Yet if there had been no road between Las Vegas and Los Angeles to begin with, it’s not clear that Las Vegas would have become the glitzy mecca it has developed into. Hence, building the road before it is needed helps bring about the very development that would render the road profitable later on via private means. (2) While it is entirely reasonable to think that many people (or maybe even most people) could be trusted to run private roads through self-interest alone, it is grossly implausible to believe that every individual owner of private roads can be trusted. There are always going to be at least a few people who will use their property in ways that seriously harm the so-called public interest. What if the road to my house, for example, was inherited by a radical leftist, or a white supremacist, or an extreme environmentalist? What would prevent such a person from discriminating against any individual he doesn’t like? What would prevent the radical leftist, for instance, from refusing to allow conservatives to use his road? Or the white supremacist from refusing to allow blacks to drive on his street? Or the extreme environmentalist from refusing anyone to drive a car on his property? How would you like to be unable to get to your place of residence because the owner of the road to your home doesn’t, for one reason or another, approve of you? “But the market punishes such irrational people,” advocates of private roads might say. “They will lose control of their road, eventually.” Eventually? How long is “eventually”? One month? One year? Ten years? In the meantime, you can’t access your own property. There’s a very good reason for making roads public property. They are too important to be placed in the hands of whimsical private interests. Rational self-interest cannot be assumed to work in all cases, because not all people are rational. But what if the advocates of the privatization of roads are willing to make an exception for residential streets? Shouldn’t we at least have highways privately owned? Not at all, for the same logic holds. I live in one of the more isolated areas in the country, along the northern coast of California, in Humboldt County. On one side I am faced by a treacherous Pacific Ocean, a grave yard of many a ship, and all other sides, by steeped, rugged, mountainous terrain. There are only four roads leading out of western Humboldt County: one to the south, one to the north, and two to the east. Suppose these roads were private. In that case, they could be sold. What if some left-wing billionaire (a cross between, say, George Soros and Al Gore) got ahold of all four of those roads: what would prevent him from basically shutting the roads down? After all, they are his property: he may do with them as he pleases, the public be damned! I haven’t even mentioned the very real possibility of monopoly abuses of roads. Given the immense costs of building the road (and the immense difficulties of acquiring the property for that road), many highways would constitute natural monopolies that could easily be used to exploit consumers. Even though society may be little more than a collection of individuals, this doesn’t mean there aren’t broader interests shared by most of the individuals in that society. One of the interests that all rational individuals in a society share is to live in a society where roads aren’t at the mercy of the individual whims and eccentricities of private owners. This must be a very difficult retirement for the former Fed chief. Regular contributor Neil Parille reviews the Objectivist approach to intellectual history. Although Objectivists often present their views dramatically and hyperbolically, the Objectivist claim about the influence of thinkers on the course of history is not new with Rand (nor, in a rare display of modesty, did she claim it was). For example, the historian Christopher Dawson wrote in his 1953 work Understanding Europe: “What we all tend to forget, however, is the way in which even the most irrational phenomena in the modern world . . . have been conditioned and in some sense created by the ideologies of the past, so that behind the modern demagogue and dictator there stands the ghost of some forgotten metaphysician.” (Dawson, Understanding Europe, p. 152.) Other examples are Richard Weaver’s contention that Western culture got off the wrong track with medieval nominalism and Eric Voegelin’s thesis concerning the influence of Gnosticism on revolutionary ideologies. First, is it really the case that the fate of knowledge depends on the right theory of concept formation? History doesn’t bear this out. To take one example, consider the “fate” of mathematics in the twentieth century. No one can deny the tremendous progress that mathematicians made even though there was no agreement as to the conceptual foundation of mathematics or even the definition of a number. Nor does it appear that physics and chemistry (both heavily mathematical) suffered as a result of this conceptual logjam, contrary to what Objectivist “super logic” might suggest if knowledge is contextual and hierarchical. Is there any reason to doubt that science and technology will continue to make progress even if the Objectivist theory of concept formation remains unheralded? Rand is rarely subjected much in the way of vigorous literary criticism, as most of the criticism is quickly dismissive or shamelessly adulatory. 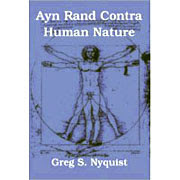 Hence Thomas F. Bertonneau's "Ayn Rand's Atlas Shrugged: from romantic fallacy to holocaustic imagination," published in the conservative periodical Modern Age (Fall, 2004), comes as a welcome addition to the very small collection of intelligent, insightful criticism of Rand's fiction. As Wilson had "always detested the 'fallacy of insignificance' in modern literature, the cult of smallness and meanness, the atmosphere of defeat that broods over the twentieth-century novel," he "was delighted by the sheer health of Ayn Rand's view." (13) He can even understand, he writes, what Rand means when she extols that virtue of selfishness for which so many applaud or revile her, depending on their perspective: "Selfishness has always been man's vital principle--not in the sense of ... indifference to other people but in the sense of intelligent self-interest." (14) Yet while Rand might lay claim to "a considerable intellect ... it is ... narrow and incurious" so that, "having established to her own satisfaction that all that is wrong with the world is lack of faith in reason and its muddled ideas on self-interest and altruism, she seems to take no further interest in the history of ideas." Wilson's critical remarks are spot-on. Indeed, I would go further: it is precisely Rand's "narrow and incurious" intellect that constitutes, for me, her worst flaw. It helped turn her philosophy into a weird cult and isolated Rand from scholars and intellectuals who, while sympathizing with some of her philosophy, were far better informed than she was and could have helped her avoid some the embarrassing errors that disfigure her Objectivist ideology. The hostility with which Wilson's letter (and later his essay on Rand) were greeted by Branden and Rand demonstrate an over-sensitivity to criticism that is as unappetizing as it is creepy. Atlas Shrugged is, up to a limit, a true revelation of redistributive rapacity, even of the old call to sacrifice in its twentieth-century ideological manifestation; the novel is, up to a limit, a true revelation of ideology as a reversion to the most primitive type of cultic religiosity, collective murder as a means of appeasing a supernatural principle. It is also--it is primarily--a sacrificial narrative, as most of popular, as opposed to high, narrative ever has been and probably always will be. It follows that the novel's borrowed premise is sacrifice: Rand invites us to view with a satisfying awe the destruction before our eyes of those who have mistreated the protagonists, with whom she has invited us to identify. The standard Arnold Schwarzenegger or Clint Eastwood thriller achieves its effect by no different means. Michael Moore's movie Fahrenheit 9/11 works in the same way. Bertonneau finishes his criticism by examining the infamous tunnel scene in Rand's novel. He notes curious new evidence (from Rand's journals) suggesting "that Rand must have had actual people in mind as models of those who die, with time enough to feel the pain of their deaths." I assert that Rand plausibly thought of [Hollywood screenwriter Robert] Sherwood ... when she sent the adenoidal, second-rate playwright to his death in the Tunnel. The parallelism leads us to suspect that in the Tunnel episode Rand composes a cataclysme a clef. And what then does Atlas become but a grand fantasy of godlike revenge, a theater of resentment assuaged, a daydream of limitless ego? "After all, the theory of evolution is only a hypothesis." The facts, however, tell a different story. Businessmen, whether competent or not, generally have no scruples about seeking government favors. Nor are they doing so merely for defensive reasons, to protect themselves from harmful government interference, as Rand herself suggested. Nearly all businessmen, whether competent or incompetent, brilliant or mediocre, seek government favors and largesse. Indeed, in the 19th century, it’s difficult to find any major ones that aren’t, at least in some degree, “tainted.” Rand mentions Vanderbilt, James Hill and Edward Harriman as examples of competent businessmen who did not seek government favors. She defends Vanderbilt’s bribery of the New York state legislature as merely “to buy the removal of some artificial restriction.” Yet that is hardly the case: Vanderbilt often bribed politicians to get special privileges or to gain an edge against his competition. And he also actively sought government business during the Civil War, hiring out dangerously sub-par and undermanned boats to transport Union troops. Raising capital, particularly for capital intensive industries such as railroads and steelworks, is an extremely difficult and arduous task. It was impossible for capitalists in the nineteenth century to raise the capital from purely private sources, so various methods, often involving government largesse in the form of tariffs and land grants, were used. Other popular methods involved various forms of financial chicanery, such as watering down stocks, or seizing a business by intentionally sabotaging it, as James Hill and his cronies did with the Minnesota and Northwestern Railroad Company. In a sense, the old charge of nineteenth century industrialists being “robber barons” has a grain of truth in it. Yet, whatever their level of spoliation, whether through government aided means or through sheer fraud, they nevertheless are responsible for building the country, using their ill gotten gains to capitalize their respective industries. The essence of capitalism’s foreign policy is free trade—i.e., the abolition of trade barriers, of protective tariffs, of special privileges—the opening of the world’s trade routes to free international exchange and competition among the private citizens of all countries dealing directly with one another.. Although Rand’s primarily rationalization of free trade rests on moral arguments, nonetheless, Objectivists also contend that free trade is, in terms of economic efficiency and productivity, superior to protectionism. Yet this view is not as irrefragable as laissez-faire and other free trade zealots tend to believe. Pareto’s theory explains why protectionism helped, rather than hindered, wealth creation in 19th century America. American protectionism transferred wealth from agricultural interests to industrial interests—that is, from those who would’ve used the wealth primarily to buy consumer goods to capitalists who invested the money in industrial production. Hence the great success of American capitalism during the latter half of the nineteenth century despite the high tariffs. Entrepreneurial capitalism works best when capital is transferred into the hands of those best fitted to use it. When protectionism manages to accomplish this end, it can be economically beneficial. When protectionism achieves the opposite effect and transfers capital from those best fit to use it to those least fit to use it, the results are economically pernicious. The typical Objectivist position is that protectionism always diminishes economic efficiency. As Objectivist write Dave Holcberg puts it: [Protectionism] destroys more jobs than it creates because the overall productivity of businesses is diminished by the higher costs imposed on them.” This view, however, flies in the face not merely of the experience of 19th century American capitalism, but of Pareto’s theory, which states that, under special circumstances, protectionism may create more wealth than it destroys.